Magnetic fields are electrically charged lines of force that stream out from all objects. The earths magnetic fields pour out from the North and South Poles. These fields run north and south and are everywhere and all pervasive ~ some are trunk lines many feet wide that stream out from the earth; some lines are only a thousandth of an inch wide. Sensitive people are able to see these "energy" lines ~ what is seen are particles of energy, called prana. 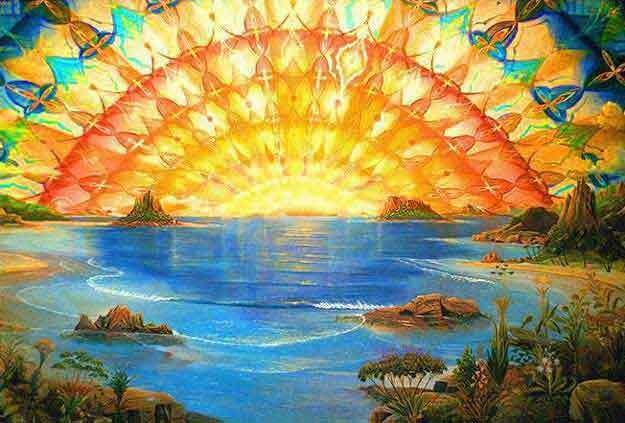 We absorb prana from the food we eat ~ the Sun and atmosphere also provide us with prana we pick up through interacting with the magnetic fields of the earth. The sun's magnetic field envelops the entire solar system in a bubble that scientists call the "heliosphere." The heliosphere extends 50 to 100 astronomical units (AU) beyond the orbit of Pluto. Inside it is the solar system ~ outside is interstellar space. Changes in the sun's magnetic field are carried outward through the heliosphere by the solar wind. Because the sun rotates (once every 27 days), solar magnetic fields corkscrew outwards in the shape of an Archimedian spiral. Far above the poles the magnetic fields twist around like a child's Slinky toy. Steve Suess (NASA/MSFC) prepared this figure, which shows the Sun's spiraling magnetic fields. The magnetic fields that surround humans constantly change due to a wide variety of influences. When solar flares (*) occur on the Sun the incoming charged particles disrupt the Earths magnetic field which, in turn, affects the human fields. On a daily basis Earths magnetic field reverses four times and, of course, affects our magnetic polarity as well. Even our clothing changes our magnetic field. As you may have already noticed, a nylon blouse feels very different from one made from cotton, or silk, linen, etc. This is more than merely a tactile sensation ~ certain fabrics "breathe" while others dont because of their ability to hold a charge. Wearing metal such as watches or jewelry, as well as being inside anything metal (a car or an elevator, for instance), will also change your magnetic field. Large steel buildings, even areas with large iron deposits in the ground, will change peoples fields. Magnetism isnt just a hidden force we interact with. The shape and structure of all things is governed by the magnetic field that underlies it. The forms of plants coincide with the field lines coming out of the earth where they grow. This energy (which is collected from the sun) pours out from the earths surface in varying degrees of intensity. Where little or too much energy flows (such as in the desert, the planets poles, high mountaintops), it is difficult for life to be sustained. Places where the fields energy pours out of cracks and fissures are populated by trees, bushes and shrubs. The field typically doesnt rise up and become biologically useful after about seven to eight thousand feet, also known as the timberline. Perhaps the magnetic field or prana is used up by that time. Granite tends to knock out magnetic fieldsbecause of this you will find very few trees growing around large areas of granite. So the magnetic fields carry the prana, and we interact with these fields everywhere we turn. We find that green park areas that feel so healing and nurturing are filled with prana. The prana comes out of the green plants and it feels good to us. This certainly feels different than spending time in a city, paved over with cement! Our bodies take in prana, located on our left side a few inches above the hip bone. If you have a damaged or blocked spleen, complete prana absorption will be difficult or impossible. We can see how the magnetic field resembles a physical energy web we live in which has its own unique frequency. Other webs exist, however, in tandem with our physical world. All of humanity is linked up in a web of thought consciousness ~ the mental plane ~ which has a specific unique frequency. The emotional plane, or astral plane, also has its own frequency or wavelength. These are all magnetic and there is a different prana or energy flowing through each and every different level or plane. 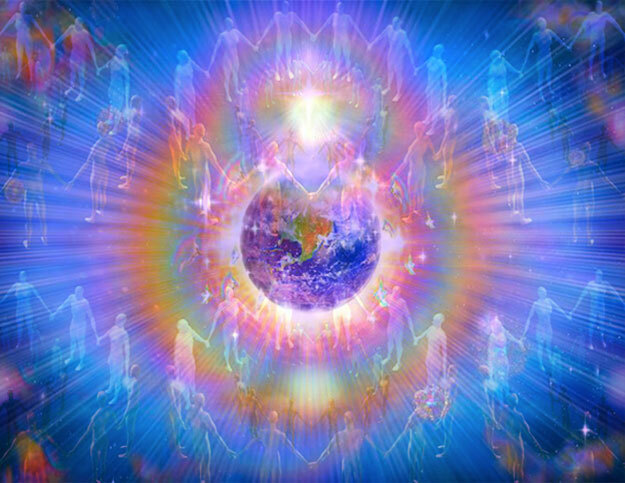 Some say that the goal of humanity is to become one with the level of consciousness on a particular prana plane ... to merge and become one with all the energy available on that plane. Love is an outstanding example of one kind of particular prana. Magnetism is not confined to only physical plane matter. There is an emotional magnetism that exists in all emotions or ideals, a mental magnetism that exists in all ideas, and a physical magnetism that exists between you and all physical objects. This is maya, a natural physical magnetism that occurs between you and all physical things including people, and is felt as either attraction or repulsion. Not only do humans absorb prana, we also give it away. Prana exchange is such a common occurrence, most people are completely unaware it is happening. We all know people who, through interaction with them, will deplete us of our energy. These people have taken prana from us; from this is where the concept of parasite is derived. Most do it unconsciously and operate from the same principle as a battery draining another battery so it can be charged or kept alive. We eat and this is a similar parasitical process. All of us rob other life forms from their prana. We parasitically eat off of each other in an energy way all the time. On physical levels, this takes the form of actually taking in prana from another, through close proximity. On emotional levels this occurs through a needy person getting some kind of reassurance or attention from a friend or lover, which leaves that person a little bit drained (as anyone will tell you who deals with emotionally upset people). Just throwing ideas around or teaching a class can take a tremendous amount of energy out of individuals. We all take and give. Our bodies have their own magnetism and also hold charges ~ different parts of our bodies hold different charges. Illness and disease occur when too much charge or energy or too little is present in the area of difficulty. All cancer occurs because a gigantic amount of energy is held in a specific location for too long. The same is true with heart conditions ~ energy accumulates and the artery hardens. The life flow is literally blocked off. Electrical charges can change and heal all of these conditions. Acupuncture with electricity running through the needles will shrink tumors. One subject reported 20 percent shrinkage of a tumor after each treatment. People in health fields who do healing work for their clients find it essential to clear away congested parts of the patients body that have become magnetized and are holding onto large amounts of other peoples energies. Any kind of fear, anxiety, depression, worry, doubt and dread is congestion. These old pranic energies need to be removed. Smudging with incense, sage, or any kind of smoke is helpful, as is washing the area with cold water ~ not hot, as heat assists absorption! Please be aware, health practitioners, of the need to remove the residual energies that have built up in your field from close contact with your patients. If you are already in a weakened state, say depressed or anxious, and find congestion building up inside of you, you are probably being tapped off by someone. When this happens try this visualization: flush such strong energy through you that the congestion is actually blown out. Perhaps gentle energy feels more appropriate to you. Thats fine ~ this will break up the congestion, but usually takes longer. then feel the light cascade down all around and through you, rejuvenating and revitalizing every cell in your body. All religious admonitions to meditate, to be Christ-like, or Buddha (or any other enlightened being), are really reminders to fill up, to find your own best energy source. Normally we fill our energy needs in the form of food, but when your hunger cant be satisfied in any usual form, go to your Soul, or Higher Self. It knows what you need and will give it to you. (*) To learn more about 2008's cycle of solar flares, click here.